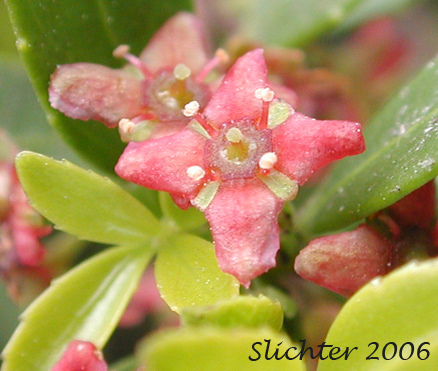 The photo above shows a close-up of the flowers of oregon boxwood. Photographed atop Chewelah Peak, Colville NF...........June23, 2006. The Oregon boxwood is an atractive evergreen shrub with numerous quadrangular stems from 20-100 cm tall. 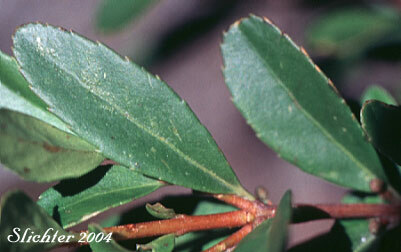 The leathery leaves are oblong-lanceolate in shape wtih short petioles and toothed margins. The upper surface of the 1-3 cm leaves is a dark glossy green while the lower surface is paler. The 1-3 flowers are small, 4-parted on short peduncles. The petals are reddish brown or maroon to dark yellow in color. The flowers are solitary or clustered in the leaf axils. The stamens are inserted at the edge of a flattened disc. The ovary is 2-celled with 1 stigma. The fruit are a one- or two-seeded capsule from 3-5 mm long with shingy black or dark brown seeds. Oregon boxwood is typically found in shady coniferous woods, especially near streams between the elevations of 4500-5500 feet, although it is found down to near sea level in western Washington. Oregon boxwood is found from British Columbia south to California and east to the Rocky Mts. 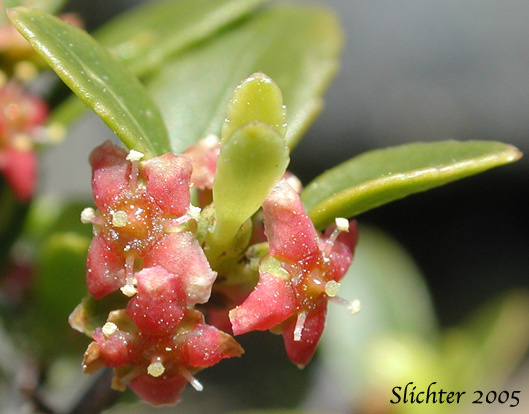 The photo above shows a branch of oregon boxwood with the flowers arising from each of the leaf axils at the tips of each branch. Photographed on Mt. Adams in the southern Washington Cascades.........June 2005. The photo above shows the serate margins of oregon boxwood, with the points of the teeth forward facing. Photographed on Mt. Adams, Gifford Pinchot N.F...........2006.